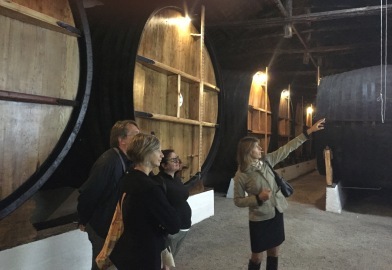 We’ve arrived in Castilla y León in the Ribera del Duero wine region, and what a thrill it was for us to visit the famed Bodegas Vega-Sicilia. The huge estate is by a highway east of Valladolid. Tight security greeted us in the parking lot before Export Sales Manager Monica Bermejo came out to greet us. They only do trade visits and is not open to the public. Founded in 1864, the current owners, the Alvarez family (members of the Primum Familiae Vini, a global (and very restricted) association of some of the world’s top winemaking families) purchased the estate in 1982. Their flagship “Unico” is the first growth of Spanish wines with an illustrious history and is considered one of the greatest wines in the world. The word Vega refers to the green vegetation that grows along the riverbank of the Duero River while Sicilia refers to Saint Cecilia, the patron saints of musicians, after whom several villages in Castile and León is named after. 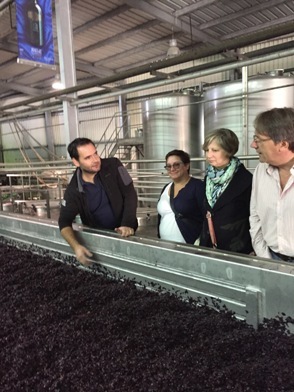 We visited the cellars and these are the grandest, state of the art and cleanest facilities this writer has seen. The stainless steel tanks look brand new, they are so polished. You can eat off the floors. There is a full time cooper with support staff for constructing their barrels to exacting standards. There are no spills or leaks on any of their barrels! The solid concrete doors are 3 inches thick. Many of Vega-Sicilia’s 250 acres are planted with old vines, some more than 100 years old, and thus usually produce a very low yield during harvest. In fact, many of the plantings that go into the flagship Unico wines are often harvested at less than one ton per acre and the vines are only replanted once they die. In the middle of the grounds, there is a gorgeous Japanese garden. The Unico Gran Reserva is the signature wine of Vega-Sicilia that is usually released at least 10 years after vintage though some bottlings may not be released for up to 15 years or even longer. Taken from some of the oldest vines in the Ribera del Duero, the wine is mostly Tempranillo (approximately 80% but depending on vintage) and Cabernet Sauvignon (approximately 20%). In an average vintage, Unico will account for a little less than a third of Vega Sicilia’s production. This wines ages effortlessly and decades of patience is required even after you’re lucky enough to acquire a bottle or two (only around 7000 cases production for the world) – there is a reason why it is called the Latour of Spain. We tasted a 1991 Unico at a restaurant and it was a baby that needed another 15 years. Rumors has it there’s a 5000 person waiting list for allotment, and those that currently have allocations will certainly not let it go. In poor vintages, the winery will not produce any Unico (as in 1992, 1993, 1997, 2001). Vega-Sicilia has founded its success on its meticulous wine-producing practices with no compromises and this visit shows that. In the vineyard it applies low yields, aided by green harvesting, and a painstaking grape selection. 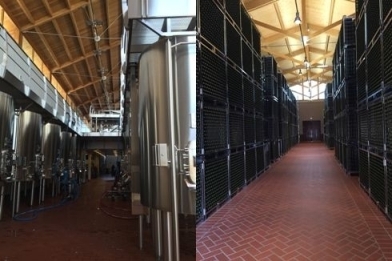 In the winery, wines undertake Unico sees a complicated and expensive series of rackings from huge barrels to new oak, to used American oak, back to new oak again, and on it goes. Despite the long barrel ageing, the wines are never dried out or overly oaky even when tasted years on, which is compelling evidence of the superb quality of its raw materials. There is Especial Reserva, a limited release blend of various Unico vintages, and the second wine Valbuena, both of which we see very little of in Alberta. The nearby Bodegas Alion estate is the innovative addition to Vega-Sicilia’s portfolio. It produces a high quality wine for drinking young. Vega-Sicilia also owns the Hungarian Tokay estate Oremus (we tasted the Oremus Dry Furmint Mandolas and it was extremely good) that produces the sweet Tokajis, as well the Toro based Bodegas Pintia (great value for money) that is excellent. Recently, a joint venture with Benjamin de Rothschild family in Rioja has come on line in a new winery called Macan that we look forward to tasting. the family owned Quinta do Portal, located in the heart of the Douro Valley. 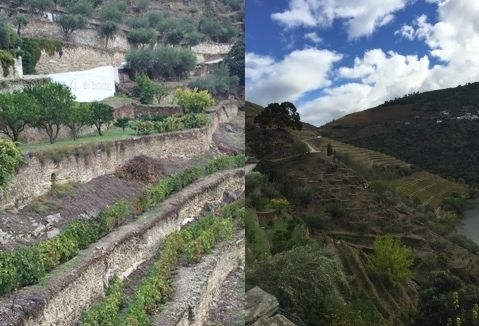 Quinta do Portal was established only in 1994, but this property has been in the Douro for much longer before that (first references date back to 1477). The family Mansilha Branco was instrumental in the original demarcation of the region in the mid 1750’s. Today, owner Pedro Mansilha Branco runs the estate. 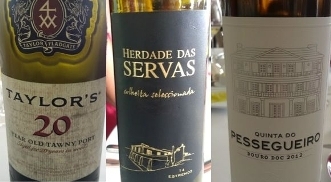 More than one hundred hectares are under vine, and the fruit is sourced from five high altitude ancient vineyards or quintas: Quinta da Abelheira, Quinta do Confradeiro, Quinta dos Muros (over a century old and escaped the Phylloxera carnage), Quinta do Portal and Quinta das Manuelas. 50% of the grapes of the production of the Quinta do Portal wines come from the company vineyards, the other half is purchased from growers in the Pinhao and Torto Valleys. Most of the vineyards lie at high altitudes for the Douro, so escaping the incessant summer heat, at least by night, and producing grapes that make their wines both fresh and elegant. Fine Tawny and Ruby Port (nice every day-er’s), Six Barrels Tawny Reserve (delicatedly balanced with fine length), Six Grapes Ruby (vibrant and not too sweet), 2009 Late Bottled Vintage (very nice indeed), 2012 Douro Colheita (very close to the Wine Spectator Top 100 2011), 2011 Reserva (very fine and very much looking forward to its arrival in the store), 2009 Grande Reserva (pretty darn good from a difficult vintage). Later at dinner, we tasted their two top reds – the 2009 Auru, world class red consisting of the best Touriga Nacional and Tinta Roriz grapes (remarkably rich and well balanced), followed by the ultra-rare and limited non DOC 2012 Black Pur (made primarily of Tinta Roriz with some Cabernet Sauvignon and Malbec) – jaw dropping and one of the wines of the year for me! We stayed in their lovely hotel/guest house “Casa das Pipas” with stunning views and an lovely old world feel. The meals (dinner and lunch) were exquisite, we must praise Chef Milton Ferreira for Michelin quality dining. If you are ever in the Douro, you must stay here! Winemaker Paulo Coutinho and owner Pedro Mansilha Branco has done a fine job raising the wines to a new level of quality with hard work and heavy monetary investment (a Siza Vieira designed warehouse) to upgrade the winery. We had a brief visit with Paulo who let us taste some Malbec and Touriga Nacional 2015 – this is a declared year in the making. 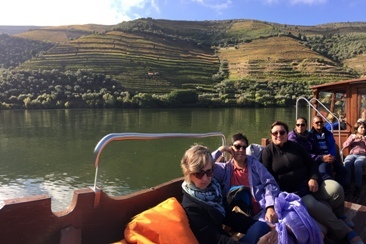 Before we left, we were treated with a boat ride on the Douro River (breathtaking way to see some of your favourite estates). Kudos to Tourism manager Manuel Januario – we were blown away with this visit, they treated us like kings and we are greatful for their time and hospitality. 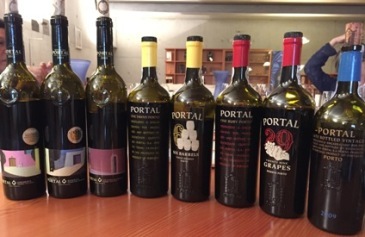 Portal is fast becoming one of the giants of the Douro Valley for both Douro reds and Vintage Ports, and this visit confirms their continued ascendancy. car driver is stressed for any moment you can go over – there is no speeding here so give yourself plenty of time as patience will be required. It is a nightmare for anyone who suffers from car sickness – Gravol city. 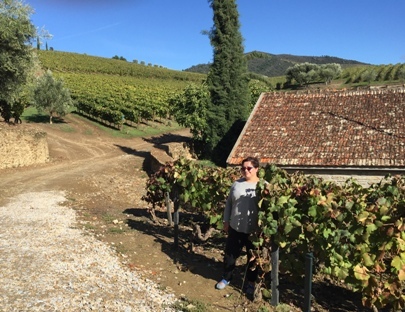 We remarked with laughing coincidence when the Beatles’ Long and Winding Road shuffled itself into play as we approached Fonseca’s Quinta do Panascal. Some four km’s west of the town of Pinhao is where Fonseca’s Panascal produces some of the best ports in the region. Panascal takes its name from the cocksfoot grass that proliferates across the hillside. Its west and southwest facing site means the entire area is exposed to sunlight. Different slopes produces grapes of different character that give the Fonseca ports is complexity and unique character. Similarly, different grapes are planted in different areas – Tinta Roriz are on a ridge, Touriga Nacional on high slopes and Touriga Francesa in low lying areas. The 70+ hectare estate is Fonseca’sflagship estate. as its 2011 VP and 2012 Quinta do Roeda clearly shows. the Douro region, but seeing is believing and certainly makes you appreciate the end product that much more. cellars of this venerable estate, founded in 1692.
uphold – imagine the dilemma of choosing where to put your best grapes into port or table wine? Vintage Port and 2012 Quinta de Vargellas Vintage Port. (each year having to clean out all barrels holding the tawniesand transferring the wines to cleaned barrels – imagine the labour and cost of doing this each and every year for 40 years for the 40 year old tawny). right and will age for two decades. 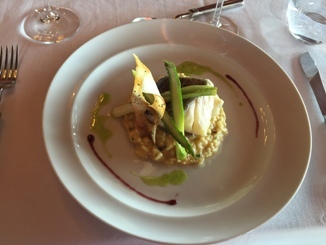 has a Michelin star award in the 2012, 2013, 2014 and 2015 Guides. We had a first class five course lunch, tasted a couple of producers we’ve not had before ending with a spectacular dessert paired with the Taylor 20 Year Old Tawny. BTW, the Yeatman Hotel is a dream, the views are out of this world – what a great day it has been! 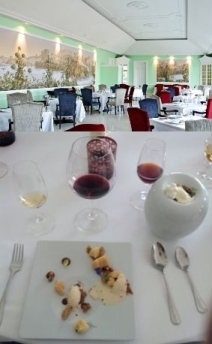 the Yeatman Restaurant, and a fabulous dessert!